I snagged a copy of Munchy off Ebay after one of the Critic's readers suggested it for review and I realized it wasn't in my collection. Having never heard of it back in the day, I'm not sure this game was ever officially released by a real publisher, and I was unable to find much information about it online. Munchy is, for all intents and purposes, Pac-Man. I mean, just look at the picture for cryin' out loud! I have to believe that if any legally-recognized company put this product out on the market they'd have been sued by any combination of Atari/Midway/Namco. You run around a maze eating dots, avoiding ghosts, and occasionally gobbling up fruit for bonus points. If you eat a large dot, the ghosts become vulnerable for a short time and you can snack on them for extra points. As far as I could tell the course layout is identical to the original Pac-Man and even the ghosts are the same colors. I think the biggest difference is that Munchy has the status information (score, # of lives, current bonus fruit) displayed on the right-hand side of the screen, making the actual playfield slightly more "up and down" than the official Atarisoft version. The sound effects were slightly different, with a continual "woooo woooo woooo woooo" which will make you think your little brother is behind you trying to imitate the sound of a fire truck as best a 7-year old can. Yes, it's THAT annoying. I do like the display slightly better on Munchy than I do Pac-Man, so it's a complete toss-up as to which one is better if you're a Pac-Fan. © Copyright 2011 The Video Game Critic. I recently had a chance to play the original Pitstop with the Critic on his Atari XEGS, and Pitstop 2 isn't much different. You have the option of racing 3, 6, or 9 laps around any one of six tracks (or all six if you select Grand Prix). The graphics are much improved over the original. That isn't to say they're spectacular by any stretch, but compared to the original it's like night and day. As you race around the track you need to avoid other vehicles and keep an eye on your fuel gauge and tires. If you're running low on fuel or your tires are worn (as indicated by different color bands that appear on them) you'll need to make a pitstop. What could have been an interesting "mini-game" is a bit of a mess in this iteration, as it's more difficult to change tires than I remember in the original. Trying to maneuver your tire-changer around the front and back of the vehicle and then line him up just right is a maddening exercise in frustration. Apparently the developer realized this and put some dotted "guiding lines" on the ground but you still have to fuss around to get him to the sweet spot. Considering how speed is the #1 criteria for pitstops in real racing, it's amazing how slow and clumsy your crew is. Refueling is much easier; the gas man only goes left or right, so you move him towards the car until he starts pumping and push him away when you've got enough. Do not let him overfill your tank, as that will lead to your fuel dropping back to nothing and you'll have to refill it all over again. You can usually get away without even hitting the pits if you're only racing three laps, but otherwise you're sure to run out of fuel or blow a tire before you complete the race. One odd thing about this game is that it always presents the action in a split-screen format, even when playing the computer! When playing against another player I find myself glancing down occasionally to see what he's up to, but I really don't care when it's the computer player. It's a shame they don't have the option for playing full-screen, but what can you do. The audio is limited to your racing engine and some minimal sound effects when you do hit the pits. Pitstop 2 isn't bad for an early 8-bit racing title. The two-player split-screen was pretty unique for the time, but the lack of a save feature for best lap or race times hurts its replay value. © Copyright 2011 The Video Game Critic. Check it out - a game set in the future that actually takes place in the future! In 2061 genetic experiments are in progress aboard an orbiting space station to develop a stronger, heartier race of mining creatures. What could possibly go wrong? Project Firestart casts you in the role of an intrepid "fixer" sent to retrieve the station's log files, initiate self-destruct, and get the heck out of Dodge before two hours elapses. Otherwise *they* well remotely destruct the ship, taking you with it. Which begs the question, why are they sending you in the first place? They must really want those logs! Once you arrive they fax you a map. Who could have guessed such a problematic, hated technology would make a comeback in 2061? I'm surprised they didn't issue me a beeper for good measure! I had read Project Firestart is considered one of the first (if not the first) "survival horror" title and I believe it. Despite minimal sound and sparse inventory there's a pervading sense of dread and foreboding as you search the deserted vessel while keeping an eye on that ever-ticking countdown. On occasion you're subjected to a jump-scare in the form of a sudden loud noise accompanied by a quick cut-scene of a mutant. When played in a dark room in total silence it is a jarring experience! Despite being armed with an energy weapon there isn't much combat. Finding your way around is the primary challenge and it can feel tedious at times. The game seems designed for confusion. You press "up" to enter a room but to exit you have to push left? And while I'm no cartographer I am a guy and could not make heads or tails out of the so-called map. I did find a decent fan-made map on the internet so apparently I wasn't the only one with issues. Apparently there are several endings to the game although to date I've only been able to achieve one of them. Sadly, it's the one where you die! There's no "Try again?" option. No, you have to power-cycle the C64 and completely reload the game. Talk about punishment! Project Firestart is a difficult and often disorienting experience. Still, when played alone at night it does a surprisingly good job of raising goose bumps and building tension as you feverish try to complete a harrowing mission in the lonely desolation of space. © Copyright 2018 The Video Game Critic. Fans of Beach-Head will find a lot to like about Raid over Moscow. Once again you're pitted against a militaristic threat, but instead of a faceless dictator, your foe is no less than the former Soviet Union! This game pulls no punches on calling out the true enemy of Democracy (at least back then). Several USSR cities launch missiles at the good ole' US of A, and it's up to you to pilot stealth fighters from an orbiting space station and kick the living borscht out of them. Obviously built using the same engine as Beach-Head, the game progresses in the same linear, mini-game fashion. The first task is to pilot one or more stealth fighters out of the space station. It's no small feat considering you're attempting to maneuver a machine not designed to operate in an airless, zero-G environment. After flying down to the offending city, you launch into a Zaxxon-like side-scrolling attack on the locals. You'll destroy military grade targets like oil fields, tanks, missiles, and... is that the NFL Hall of Fame?! School buses desperately try to escape the Hell you're raining down from above. TAKE THAT YOU EVIL 5th GRADERS!! What's that? The Russians love their children too? Big words for a man who stabbed the back of the band that launched his career, Sting! Anyway, assuming you survive you'll be presented with a new screen where you must destroy missile silos with well-aimed shots at just the proper altitude (much easier than it sounds). You'll go through this process X number of times depending on the difficulty setting, and eventually attack the Soviet Defense Center. You'll then get to experience the joy every child dreams of; launching rocket propelled grenades at the Kremlin! You'll pick off Ivan Drago wanna-bees sniping at you from the walls before entering the core of the nuclear reactor (within the Kremlin). You then do your best Tron imitation by flinging "disk grenades" at the robot feeding coolant into the reactor. Once these tasks are complete you have 2 minutes to destroy the boss. If you do, great, the city is destroyed but you somehow survive. If you fail, at least you've given everything you could in order to preserve our way of life, just like a good soldier should! In either event, Moscow is toast and America wins. Just like real life. © Copyright 2013 The Video Game Critic. In PC circles Will Wright is considered gaming royalty and Raid on Bungeling Bay is a good example why. Famously the father of SimCity and The Sims, Will had a fascination with artificial intelligence which is reflected in his early work on home computers. The concept here is to attack an empire war machine using a helicopter launched from an aircraft carrier. The Bungeling empire is spread over several islands and your main targets are factories that slowly expand and develop tougher defenses over time. Damaged factories will actually "heal" over time. Defending the factories are anti-aircraft guns, tanks, guided missiles, gunboats, and other aircraft. These are destructible by gunfire or bombs, which leads to a major sticking point. Most joysticks circa 1984 had a single button, and in this game it serves four different functions! You hit the button quickly to fire your machine gun and hold it for a half-second to drop a bomb. You hit it quickly to land on your carrier and hit it quickly to take back off. Can you guess how many times I accidentally bombed my own carrier because of this control scheme? Occasionally you'll need to protect your carrier against direct attack from the empire forces. If destroyed it will take your remaining extra choppers down with it to Davey Jones' locker. A fun sub-plot of the game is preventing the Bungelings from completing work on a massive battleship that slowly takes shape over the course of the game. You can bomb it in dry-dock to undo some of the progress or wait until it gets completed and then blow it out of the water - my favorite tactic! It's tough as heck to take out, but it feels extra satisfying knowing all the hard work those Bungelings put into that project. Raid on Bungeling Bay begins at a leisurely pace but the gameplay becomes quite frenetic as the defenses get stronger and more enemies get thrown your way. Destroy all six factories and you're treated to a newspaper article celebrating your heroics and a quick animation of a ticker tape parade held in your honor. After that it's back to the carrier for another round - no rest for the heroic! You keep playing until you lose all your helicopters, with a high score saved to floppy for future bragging rights. Bright, colorful, and innovative, Raid on Bungling Bay is a must-own for all C64 enthusiasts! © Copyright 2016 The Video Game Critic. If there is one lesson the Critic has taught me time and again, it's that to be properly appreciated, games must be played "in season". And with the surprise turn of events that lead Vladimir Putin to invade the Ukraine, this is the perfect time to curl up with Red Storm Rising! That's right, The Cold War is back in season, baby! How I pine for the simple days of old when you knew at any moment the entirety of the human race could be wiped out by a simple misunderstanding. Like the Tom Clancy novel of the same name, Red Storm puts you in command of a nuclear sub sent on missions to counteract Soviet hostilities in the European theater. The success or failure will impact NATO's effort to turn back the Soviet juggernaut. Succeed and watch cut-scenes of NATO grabbing the upper hand. Fail and watch the Soviet boot stomp its way ever westward. Graphically and audibly simple, this game focuses on simulating the true experience of commanding a sub in the north Atlantic against a technologically inferior (but numerically superior) foe. No offense to my buddy Ryan, who spent four grueling years at the United States Naval Academy in Annapolis and eight follow-on years perfecting his submarining skills at sea, but he could have saved himself ALL that mess by simply putting a few solid hours into RSR. Packed with a military-style guide, the massive tome explains not just the gameplay mechanics but provides detailed information on advanced submarining skills like torpedo evasion, running silently at depth, and setting your enemy up for the perfect kill. There's also a keyboard overlay to help you with commands in the heat of battle. A database of weapons, subs, and ships rounds out the information you'll need to successfully "stalk the Bear". Part of the game is played on an overhead map of Europe and the North Atlantic, where your sub and listening platforms are shown as icons. On this map you'll move to intercept the assigned enemy, be it sub and/or surface fleet. The screen then switches to a tactical screen where the REAL action takes place. Move above or below the thermal layer, stick with passive sensors or go "active", increase or decrease speed, and dodge enemy "fish" as they home in on you - sometimes from an enemy unseen. It's intense, it's exciting, and few accomplishments feel as hard-won and satisfying as taking out a Soviet aircraft carrier fleet - and getting away scott-free. Putin can have the Crimean peninsula, but he'd better think twice about sojourning very far from his Atlantic Fleet bases or he'll have ME to deal with. © Copyright 2014 The Video Game Critic. Booting up Rush 'n Attack rekindled fond memories of playing the game at the local arcade back in my teens. 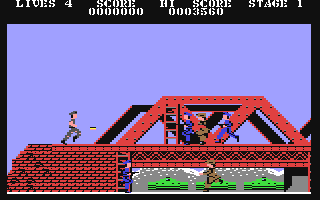 Unlike Commando (Data East, 1985) and Who Dares Wins II (Alligata Software, 1985), this is a horizontal scroller, so you'll move from left to right trying to avoid (or kill) enemy soldiers. You can climb up or down ladders to any of three levels, but enemies can do the same. Often they'll surprise you by shimmying up a ladder right into your lap! There are four POW's to rescue, one at the end of each stage, and if you can reach them all you're a better soldier than I. While not excessively hard, I found myself suffering a lot of what I considered to be cheap deaths. First off, who's the Commanding Officer in charge of planning this infiltration? This game exemplifies why you never bring a knife to a gunfight, because that's exactly the situation you're put into here - with predictable results! Sure, you can capture enemy arms as you go, but like the grenades in Commando, you must hit the space bar to use any alternate weapons. While the action is not as frantic as Commando, it's still in your best interest to stick with your knife attack. When you lose your final life the game forces you to sit through a musical number that seems to last about 90 minutes. Why not just let me start over for crying out loud!? I really thought I would enjoy playing this throwback to the good old Cold War days (the threat of nuclear annihilation was much more fun during the Reagan years) but I found myself more annoyed than entertained. Graphically Rush 'n Attack is sharper and more colorful than either Commando or Who Dares Wins II, but in terms of gameplay it was my least favorite. © Copyright 2016 The Video Game Critic. "Hey Taxi!" - "Pad 1, Please!" 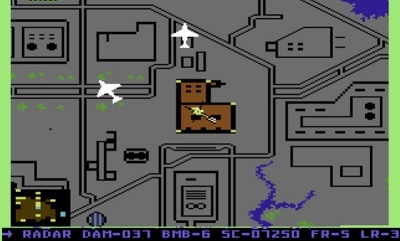 Muse Software didn't release many games during their brief existence, but Space Taxi is a fine example of how original this developer could be. 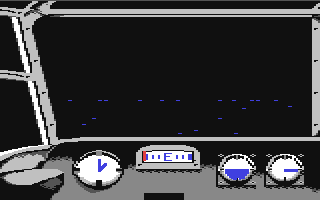 Although the graphics are pretty sparse, the sound and music make excellent use of the Commodore's SID chip ability. The point of the game is to guide your cab from one pad to another, picking up and dropping off customers as quickly as possible without dying. There are five modes of play: Morning Shift, Day Shift, Night Shift, Standard 24-hour shift, and Random 24-hour shift. Each of the first three modes contains eight progressively difficult levels, while the 24-hour shift has you play through all the levels. In real life driving a cab is only slightly less dangerous, as this game has you contending with moving obstacles, gravity, and the inability to touch any solid object whatsoever (aside from landing pads). At least none of your customers ever pull a gun on you or stiff you for your payment! You push the joystick in the direction you need your cab to go as you float through the air, burning precious fuel each time and watching as the amount of your tip quickly dips downward. Some levels have refueling stations in them, and you can land to take on more fuel as needed. However, the cost for the fuel comes out of your bottom line so you want to be very judicious and not buy more than you need to finish the level. The quicker you can get your passenger to his destination, the more you make in tip money. I played the two-player version with my son Christian who was quick to wonder aloud "Where the heck does this taxi company find cabbies willing to constantly risk their very lives for such little pay!?!" Your score is the amount of money you make, and the game saves the top 10 high scores to the floppy disk itself forever. I suspect that when I placed 2nd on the list the name I bumped off had probably been there for over 20 years! Most modern consoles don't give you this high-score saving ability! I have to ding the game slightly for the plain-Jane graphics and for making two players share a single joystick, but it does support up to four players and does an excellent job imitating the physics of guiding a taxi through space (I assume). Supposedly there's also a "secret" 25th level you can access by beating the 24 regular levels, but I'm sure I'll never see it - this game gets tough fast! Apparently a sequel, Space Taxi 2, was released in 2004 in collaboration with the original game's author (John Kutcher) and sure enough it looks like it's still for sale as a PC download (http://www.twilightgames.com/spacetaxi/spacetaxi_info.htm). Space Taxi is a prime example of a game that's easy to learn but tough to master, and I recommend any C64 enthusiast track down a copy for their collection. © Copyright 2011 The Video Game Critic. Spurred on by the Critic's recent faux-review for the Virtual Boy, I decided to boot up my old copy of Strip Poker and take a stroll down mammary lane (see what I did there?). I remember being 15 years old, loading up Strip Poker in my bedroom, and spending long, nervous hours trying to get these digital ladies de-clothed before my mom could walk in. 30 years later I find myself sitting in my basement, Strip Poker loaded, spending long, nervous minutes praying my wife wouldn't come down and catch me. (Spoiler alert: she totally busted me!) Wife: "What is that blob on your screen?" Me: "Ummmm, it’s Melissa?" Wife: "Okay... but why are you sitting here in your underwear?!" It hadn't occurred to me that I really didn't need to take off my clothing while playing this game, but I wanted to get into the spirit of the thing. Anyway scientists have calculated that there are over 4 BILLION variations of poker in the wild, but Strip Poker offers your standard five-card draw. You select between two ladies to play against, Suzi or Melissa (and oh it will be Suzi, trust me on this!). You start with $100 and an initial hand of five cards. You can stay, fold, bet, or exchange cards you don't want over three rounds. The goal is obviously to win as much money as you can, knowing that every time you take $100 of hers she must lose an article of clothing. Deplete her $100 five times and you've "won" a highly digitized drawing of a "nekkid chickie". Lose and you may have some explaining to do to your wife. I have to admit that what little I know about poker today can be traced back to those sweaty hours in my room trying to beat this game. I don't think I'm going out on a limb when I say the AI is pretty good! I could never tell when my opponent was bluffing or not. Sometimes she'd bet heavy on a crappy hand, other times she'd bet meekly when she was crushing it. Go figure! For most people Strip Poker is a novelty item with little replay value, but card players can probably bump up the grade by a letter. It may not be as exciting as it once was, but If you prefer your ladies old-fashioned, modest, and heavily pixelated, this game is for you. Okay, maybe not so modest. © Copyright 2017 The Video Game Critic. After playing Blue Max 2001 (Synapse Software, 1984) I felt the need to wash that bad side-scrolling taste out of my mouth. So I took the opportunity to boot up Super Zaxxon, a game I'd never played before but had high hopes for. Having recently played Zaxxon (SG-1000, 1984) at the Critic’s house I was eager to see how the Commodore version compared. You control a space shuttle moving over a diagonally-scrolling playfield with various targets and obstacles. After traversing the standard playfield you can enter a tunnel and... well, pretty much just keep doing the same stuff. After a second air base-type field you'll encounter one of the worst bosses I've ever had the misfortune to laugh at. It's an awesome-looking "space dragon" that takes about two or three shots to destroy. Seriously, instead of armored scales this beast is apparently made of papier mache and goose down pillows! Heck, even a stern warning would be enough to reduce that thing to tears! But hey, who am I to judge? If the fine folks at your Sunday newspaper can keep pretending that Family Circus is enjoyable, I can go ahead and pretend this is a real boss. Graphically Super Zaxxon is impressive, with incredibly smooth scrolling that stands in stark contrast with the SG-1000 version which chugs along like a turn-based RPG. The audio is decent but the shooting sound calls to mind your seven-year-old nephew imitating a laser gun (“PHEW PHEW PHEW! !”) If you're a Zaxxon fan you could certainly do worse than Super Zaxxon, but the only "super" you'll find here is the one in the title. © Copyright 2016 The Video Game Critic. Synapse had some of the best box artwork back in the day, but it didn't always translate to the best games (a common complaint in the 1980's). In Survivor you pilot a small asterisk though 2D space. You move up/down and left/right while attempting to take down large "capital ships" by destroying their laser emplacements. Each capital ship is surrounded by a shield you must break through in order to reach the lasers. While you're working on that, random flying enemies in the form of a bird, a giant X, or a smiley face occasionally approach in kamikaze-style attack patterns. Once you destroy all of its guns the capital ship will explode - taking you with it if you're too close! Survivor starts off at a leisurely pace with baddies appearing only once a minute or so and the turrets firing slowly. Subsequent levels get faster but at no point do the capital ships move, and their shields never get any harder to bust through. It just becomes more difficult to fend off the ever-increasing number of kamikaze baddies. The single player mode is much more difficult than the two-player, because in the two-player one person pilots your asterisk while the other controls its weapons. In the one-player mode you have to move your ship in the direction you wish to shoot which makes negotiating tight spaces very difficult. The joystick plugged into the second port is used for smart bombs, which makes them all but unusable unless you have incredibly fast reflexes. The sound effects are okay but the graphics are limited (asterisks in sppaaaacccccceeee!!). The capital ships are represented as outlines, and I think the developers could have done a little more to trick to them out. You can't ever "finish" the game and high scores aren't saved, but Survivor is still a fun diversion when played in short bursts. © Copyright 2011 The Video Game Critic. An example of a "rogue-like" or "RPG-lite", Sword of Fargoal casts you in the role of a hero seeking a magical sword from the depths of a dungeon. 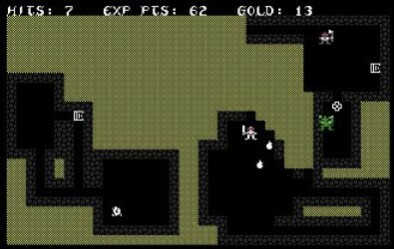 The dungeon consists of randomly-generated levels with the sword placed somewhere between levels 15 - 20. I played this game as a wee lad and played it again as an adult, and I STILL can't find that #! @$ sword!!! Each dungeon level is enshrined in "fog" until you walk around to reveal the walls. You'll find gold, chests, traps, stairs, a sanctuary, and of course, monsters. The gold is kind of lame in that all you can do is exchange it for experience (sorry D&D fans, no upgrading armor or weapons). A few monsters actually look pretty neat considering the state of the art in 1983. They're represented by small icons and sometimes reused with different names and color schemes. I especially like the icons used for the monks and spiders. Combat is initiated when you move onto a monster or a monster moves onto you. You ALWAYS want to be the one initiating combat because otherwise you'll lose the ability to disengage if things get dicey. During combat you just watch the computer resolve the fight turn by turn. My general strategy has always been to methodically clear each dungeon level one at a time, but considering my lack of success perhaps you'd be better off making a B-line for level 15. There's no save feature or ability to pause. That's a shame, especially when I had to abandon a game in progress because I had to step away. The sound effects are pretty minimal, but my wife commented about how eerie it sounds when monsters move - like something from the movie Jaws. The manual could include more information (like how a Mage can steal my hard-earned spells) but for a game written by a one guy in 1983, I guess you can't expect a tome. The lack of a save and pause is unfortunate, but it won't deter me on continuing my life-long quest to find the Sword of Fargoal. © Copyright 2014 The Video Game Critic. I try to adhere to the Critic's mantra of staying seasonal and with Veterans Day looming I was thrilled to find a still-in-shrinkwrap, unopened copy of The Dam Busters on my shelf. This game takes place during World War II - the last "good" war! 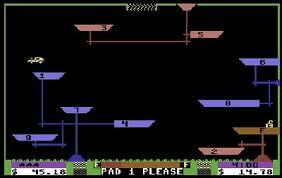 But while Accolade published some fine games for the C64, I quickly learned this is not one of them. The Dam Busters puts you in the role of pilot, navigator, gunner, and bombardier of a British Lancaster bomber on a mission to destroy a German dam. Along the way you'll encounter barrage balloons, anti-aircraft flak, enemy fighters, and spotlights. If it sounds like a thrilling incursion, dial your expectations back now! First of all, missions occur in the dark of night, so while you can look outside from a variety of angles, it's always blackness staring back. I spent over an hour just trying to get through the "tutorial" which lets you practice bombing runs with no resistance. You're given a quick lesson on how to set your throttle, boosters, altimeter, and airspeed to the ideal settings. The instructions tell you to "move your throttle down slightly until your RPM gauges read two o'clock", but your gauges immediately begin to drift. Is that good? Bad? Does it even matter? The instructions also reference where the "red needle" airspeed indicator should be in relation to the "blue needle". The problem is, both freakin' needles are blue! It's as if the person writing the documentation was given design notes that didn't match the final product! Needless to say, at no point did I ever remotely come close to bombing a damn thing ...which ironically is what I was trying to do in first place. Nine times out of ten I just plowed into the ground, with the reason provided "failed to put out engine fires"? Eventually I quit the damn/dam tutorial and jumped straight into the second scenario. The ability to ward off enemy fighters, shoot down barrage balloons, and destroy searchlights elevates this game from pure "F" territory into "D" range, but only because it was vaguely playable - although not particularly fun. I tend to gravitate toward flight simulators and war games, but The Dam Busters is one that completely misses the mark. © Copyright 2018 The Video Game Critic. Never have I wanted to like a game prior to playing it quite as much as The Last Ninja. Apparently a huge hit with our Commodore brethren across the pond, the game was released late in the C64's life cycle yet still managed to spawn two sequels. I'd heard plenty of buzz and seen lots of screen shots. The game features an isometric game field (a la Zaxxon), beautiful graphics, wonderfully immersive music, and of course - Ninjas! Can't miss, right? Wrong! I spent about an hour trying to get into this game and all I got for my trouble was frustration and bloody knuckles. The Last Ninja employs a unique control scheme, whereby your character will move in one direction while continuing to face another. In order to face the way you're actually moving, you need to rotate the joystick around to that direction. Sound confusing? It is. I can't tell you how many times I was getting a sword to the face (or a foot to the junk) as I flailed at thin air because I couldn't face my assailant in the heat of battle. As you walk from screen to screen looking for items and exploring, you'll face enemies one at a time, pray at statues, and navigate obstacles. At a water crossing it took me about ten tries before I could successfully make the three jumps from rock to rock to the other side. The isometric view makes judging your spacing and lining up angles extremely difficult. If it weren't for a website that shows you the exact jumps, I may never have made it. Picking up objects, necessary to advance the game, proved equally difficult. It probably took me five minutes to figure out how to pick up my first object (a sword on a rock). I could occasionally pick up a key, but at no point was I able to successfully pick up something from the belt of a dead man (nun-chucks?). Apparently you have to be standing at just the right pixel to execute the "crouch and grab" technique, and it drove me mad. I've read there's a dragon you have to either kill or run past at the end of the first level, but I couldn't bear the control scheme long enough to find out for myself. The only things saving this game from an "F" are the impressive graphics and the excellent music. Had they simply made your ninja face the direction you moved, this game could have been a real winner. I'm sure I'll eventually muster the patience to give The Last Ninja another go, but unless I have some incredible epiphany I'm afraid I'll never understand why this game was so popular. © Copyright 2012 The Video Game Critic. Continuing my binge of Veterans Day shooters, I decided to go with the Commando-inspired import Who Dares Wins II. After all, it wouldn't be right to ignore our SAS brothers overseas. So why start with the second in the series? Because I don't own the original - that's why. From what I've seen online however, there isn't much of a difference. There's no doubt Who Dare Wins II is a Commando (Data East, 1985) rip-off, as both play nearly identically. You're a soldier armed with a rifle who must travel up the screen avoiding enemy combatants while trying to rescue fellow soldiers and capture outposts. There are eight levels to clear and if you finish them all you start back over at level one. Yes, being a foot soldier is a thankless job! "In gratitude of your unflinching and dedicated service, you're now going back to the front to do it all again soldier!" I must confess I prefer this to the arcade port of Commando. Who Dares Wins has a slower and calmer pace, so you can be thoughtful and strategic instead of straight run-and-gun. Additionally, they managed to implement a functional method of grenade throwing. You simply hold the fire button a second longer than you normally would. While this sometimes causes you to throw a grenade inadvertently, it's far better than having to hit the spacebar like Commando. Several levels begin with a man tied to a pole about to be executed, and you can save him if you can shoot his executor in time. That's pretty cool. The game also put a lot of thought into the vehicles, incorporating ground-strafing fighters, trains, boats, bombers, and robotic tank things. 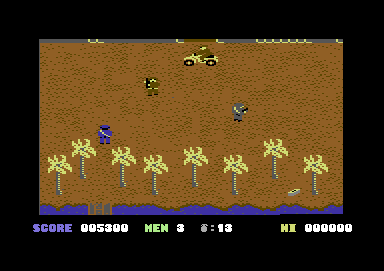 Who Dares Win II is a fairly easy game as C64 shooters are concerned but I appreciated its deliberate pace and so did my thumb. © Copyright 2016 The Video Game Critic. Continuing my trend of reviewing games just past the point of anyone caring (baseball after baseball season, football after football season, the WNBA at any point in time), I figured a solid week after the Sochi Olympics would be the best time to review Winter Games (No IOC trademark here! Any resemblance to actual Olympic events is purely coincidental.) Building on the success of Summer Games, Epyx takes the action to the colder climates and challenges the player to achieve the best score in any of seven winter-themed events. You enter your name, choose a country to represent, watch the opening ceremony, and then it's off to the slopes. The graphics do a great job of conveying the feeling of playing winter sports and playing in my basement on a real life "snow day". I swear I felt a few degrees colder from looking at the screen than I did before I booted the game up. You begin with a trick-ski event called Hot Dog, where the object is to leave a downhill ramp, do as many varied tricks as possible, and then stick your landing. Like most events, the timing of your joystick movements is crucial and landing correctly is an absolute bear! This event is followed by the biathlon (much better) and the incredibly weak and ponderous figure skating (just like the real Olympics!) Then there's the ski jump, speed skating, free skating, and finally bobsled. You can compete in any single event, practice one event, or play through all seven in order. As I mentioned previously, the timing of your joystick is crucial to doing halfway decent in all of the events. Then again, if you're playing by yourself you're bound to get at least six gold medals no matter how poorly you perform, as there are no computer-controlled opponents. You can still shoot for "world records" though, and best scores get saved to disk for future generations to admire and worship you over. Despite playing this during "the winter that doesn't want to end" and fresh off the actual Olympics, I had a hard time getting into Winter Games. The controls were just awkward and the weakest/lamest event (figure skating) effectively makes up two of the seven events. Why not include hockey or curling? I'd go back to see if I can get my name saved to disk for at least one event (preferably the biathlon), but there isn't much draw beyond that. Like most sports games of its time, Winter Games is much better if you have a human competitor, which would probably bump the score up to a B-. © Copyright 2014 The Video Game Critic.